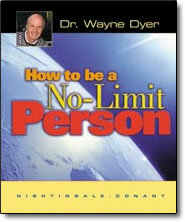 How to Be a No-Limit Person – CD by Wayne Dyer – Discount! Experience a different side of Dr. Wayne Dyer — and discover one of the best-loved, bestselling programs of all time! Before Dr. Wayne Dyer shifted the focus of his work to spiritual matters, he’d already won worldwide acclaim as a brilliant speaker and gifted motivator. His early books and audio programs were renowned for their refreshing, accessible style and vitally important messages. One of the greatest of these is the beloved classic How to Be a No-Limit Person. In How to Be a No-Limit Person, Dr. Dyer shines a sometimes irreverent, always insightful light on the significant and subtle ways we defeat our own calm, happiness, success, and sanity. With the straightforwardness and humor that continue to captivate audiences around the world, he shows us how and why we allow and sometimes even encourage circumstances outside of us to disturb our inner harmony. Then he offers an alternative: the path of the No-Limit Person. On this path, you achieve anything you set your mind to do. You’re happy and productive no matter what the circumstances. Life’s little frustrations just don’t upset you anymore. You face your fears and challenges, and find ways to grow beyond them. Once you experience this classic motivational audio seminar, you’ll understand why it has endured as one of our bestselling titles. And you’ll never look at life quite the same way again.